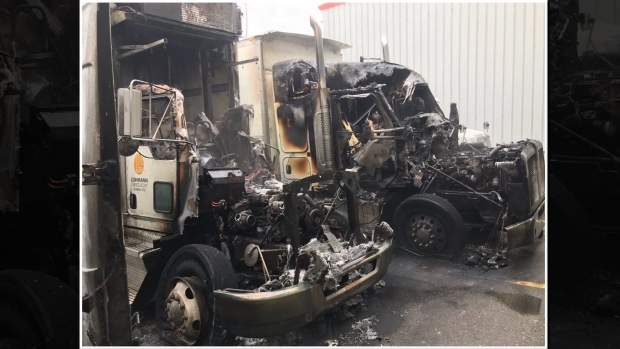 Two trucks caught fire at a Brantford business Monday. Firefighters were called to the loading ramp behind 180 Garden Avenue around 10:25 a.m. When they arrived, the cabs of two trucks were already fully engulfed in flames. The fire was extinguished before ut could spread to the nearby building. Firefighters believe it started in the cab of one of the trucks and then spread to the other. They say there was nothing suspicious found at the scene and the cause of the fire is still not known. No one was inside the trucks at the time and neither vehicle was running. The building is owned by Lohmann Tierzucht Canada, a chicken breeding company.